Most people are familiar with the high-quality of Bosch washer and dryer. In fact, Bosch offers some of the most popular compact washers and dryers available on the market. Small footprint and the fact that these landury machines don’t require ventilation allows you to easily stack them in most closets or even place them side-by-side under a standard countertop. Moreover, installation is easy and these units even plug into each other, needing only a single 240 or 208-volt (commonly refered as 220V) outlet. However, one common question we get from our customers is what distinguishes one Bosch washer model from the other? This is a pervasive point of confusion, mainly because Bosch product descriptions often use jargon and terminology geared toward industry insiders, not average users. So, below you’ll find a simple, straightforward guide to helping identify the critical differences in Bosch washer and dryers so you can select the perfect one for your needs. We'll look at the most important factors that make a great washer, including noise ratings, cycles, durability, and other critical points to consider. In the end, you'll have a better understanding of what exactly sets one Bosch washer from another. Note: Because the key differences in the product lines generally apprear in the washing machines rather than the dryers, the Bosch washers are the main area of focus below. First off, let's take a look at three of the most representative Bosch models in each of the three series-- the 300, 500, and 800. PRO TIP - Make sure to contact our staff at (888) 714-4938 to inquire about unpublished savings on Bosch washer and dryer. The Bosch 500 Series WAT28401UC still at 2.2 cu. ft. capacity but handles larger payload of approximately 18 bath towels. AquaShield Leak Protection, which uses a special double-walled feed hose and safety valve to provide protection against water damage. 170F Sanitize temperature and better sound insulation (52/72 dB) make this a popular Bosch washer. The Bosch 800 Series WAT28402UC Same size and capacity as the 500 series this Bosch washer features AquaStop Plus Leak Protection, which includes the double-walled feed hose and safety switch plus a drip pan with float switch that makes leaks nearly impossible. It also features a 15-minute fast cycle that's handy when you're in a rush. This Bosch washer is very silent at 50 dB during wash cycle and 71 dB during spin. You will find the interior LED lights, chrome trim and stylish control panel luxurious. The Bosch 800 Series with Home Connect WAW285H2UC Home Connect allows you to manage your laundry from your cell phone or tablet. This model also features the EcoPerfect Cycle, which significantly reduces energy consumption. A washer or dryer can have all the fancy technology upgrades in the world, but if it doesn’t wash or dry clothes effectively, then it doesn’t amount to much. Fortunately, Bosch models bring both. They've earned a reputation as a trustworthy brand in the U.S., one of the most dependable and sought-after manufacturers in the country. First and foremost, let's talk about cleaning power. Bosch's wave-shaped drums protect clothes with powerful yet gentle cleaning. With 15 cycles and 9 options, each of your cleaning needs are covered. The 15 cycles include Permanent Press, Permanent Press Heavy Soil, Permanent Press Light Soil, Delicates, Quick 30 min, Rinse/Spin , Hand Wash/Wool, Drain, Cotton Normal, Cotton Light Soil, Towels, Allergens, Jeans, Heavy Duty, and Drum Clean. Options include SpeedPerfect™, Temperature, Finish In, Extra Rinse, Prewash, Spin Speed, Start/Pause, Child Lock, and Signal. When it comes to drying power, Bosch is no slouch either. Bosch provides a minimum of 1400 RPM for their washers, a higher RPM than many other brands. This brings faster drying power alongside a stainless steel drum with interior LED light, augmented by the option for condensation drying with an external duct. Condensation is the newest innovation in drying technology. The Bosch Condensation Dryer uses an eco-friendly solution to gently dry clothes at an optimal temperature without the need for external ducting. So how does it work? Let's take a look. Cool ambient air enters the dryer from the living area. Cool ambient air is heated by the heating element at the back of the dryer. Hot air circulates in the drum, evaporating moisture from the load. The combination of hot air and moisture causes air to circulate through the condenser unit. The hot air and moisture condenses into water as it passed through the cool condenser unit. The water is collected under the condenser unit and pumped out by the drain pump. Warm dry air is reheated and circulated back into the dryer drum. The benefits of this drying method include the fact that there is no ventilation setup required, plus lower energy costs than vented models and an easier installation, too. When it comes to energy efficiency, all Bosch washer models are Energy Star Qualified and exceed all government standards for energy saving design. They feature an Internal Water Heater that heats water more quickly and efficiently, plus ActiveWater technology that ensures efficient water use. There's also a Load Adjustment Function that automatically adjusts water usage based on the load size to reduce energy and water consumption. Bosch's most recent machines improve on every aspect of their predecessors, including noise and vibration. The new models' Anti-Vibration Circulator Walls reduce vibration for increased quietness and safety, while the EcoSilence Motor delivers quiet, efficient and long-lasting performance. Quiet operation int he laundry room means a less disruptive laundry experience. Bosch's patented AntiVibration system constains sensors that monitor the load weight and movement of the drum in order to eliminate imbalance. The circular profile reinforces the side wall and increases the washer's stability. This structure, combined with enhanced insulation, regulates noise levels (between 50-71 dBA) and reduces vibration up to 30% so your laundry day is quieter and more peaceful. When it comes to ergonomic design, Bosch simply can't be beat. Each of their models come in 24" width designs, with a minimum stack height of 67 and 3/4 inches with a matching dryer pair. 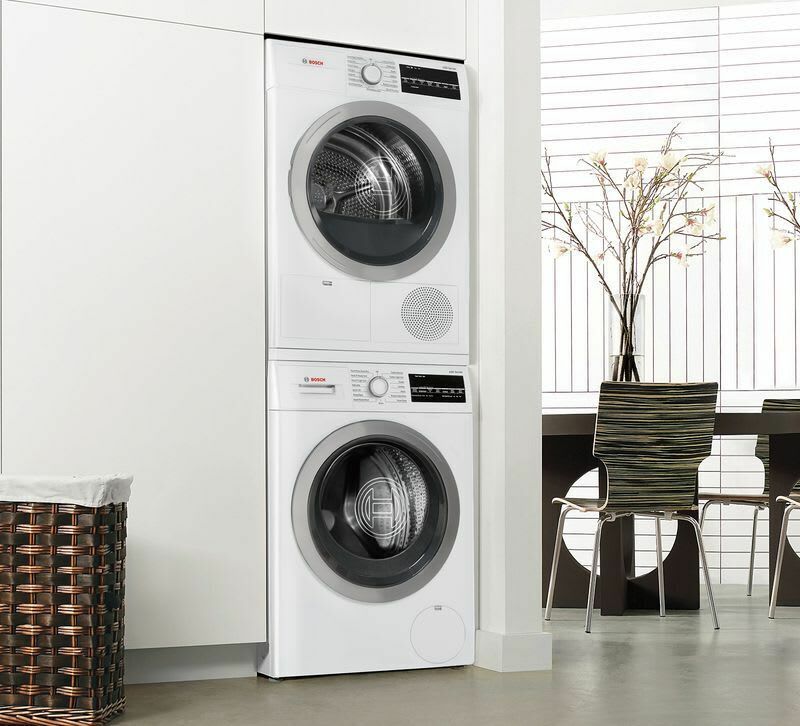 The Bosch 24" laundry pair can be installed stacked, side-by-side, on pedestals, in a closet or under the counter for maximum flexibility. Bosch 24-inch washers also feature a sleek design that offers best in class installation. That means you can stack them in a closet with no problems at all. It's also important to remember that you can plug the washer directly into your dryer to simplify installation. Finally, 24" Bosch machines are compliant with the ADA (Americans with Disabilities Act). That means they meet ADA height and access requirements and operable parts requirements for ease of use. You may look at our best compact washer & dryer guide for more in-depth information. Thanks to Home Connect™, you don’t have to guess which setting to select for your clothes. EasyStart recommends the best program based on the types of clothes you select in the app.With your Bosch connected washer and dryer, you can start a cycle from anywhere using your smartphone or tablet. Now those last-minute changes to your laundry cycle don't have to throw off your entire day. Home Connect™ even provides energy and water consumption information for each laundry program, giving you even more information and customizability than ever before. Because Bosch tends to use special terms to describe the features and cycles of their machines, let's take a look at some of these terms so you know exactly what they mean. ActiveWater® Technology The automatic load adjustment recognizes the load condition in three steps and ensures that only the amount of electricity and water required for that load is used. The continuous automatic load adjustment in compact washers and dryers with ActiveWater Management achieve even more accurate results. AquaShield® Provides Protection Against Water Damage. It uses a special double-walled feed hose and safety valve to provide protection against water damage. SpeedPerfect™ Provides Up to 40% Faster Washing Time as compared to Perm Press Heavy Soil cycles without SpeedPerfect. WTG86402UC model even has super speed function for under 15 min wash.
EcoSilence™ More energy-efficient, stronger, quieter and long-lasting – that is the new EcoSilence Drive™. Instead of carbon brushes, it is driven by powerful, permanent magnets. This means that there is no more friction – and, in turn, no more wear and tear or energy loss. AquaStop® AquaStop Leak Protection System. In the event of a leak in the machine or the hoses, AquaStop kicks in to stop the water. It automatically shuts off the unit and pumps out all the water in the machine if the overflow switch detects water in the base. Sensitive Drying System Uses warm, mild air to gently dry. Home Connect: This signifies a WiFi-enabled unit. Sensor-Controlled Drying: Sensors measure the temperature and remaining moisture, protecting your laundry from excessively high temperatures and overdrying. 14 Dry Cycles: Permanent Press, Cotton, Towels, AntiShrink, Sanitize, Hand Wash/Wool,Bulky Items, Quick Dry Auto, Jeans, Delicates, SuperQuick15, Quick 40, Time Dry, Air Fluff/No Heat. Child Lock Option: Prevent your machines from being opened while in use with this option. Reversible Door: Allows you to access laundry from the right or the left based on your laundry room or closet arrangement. Dependable and offers an impressive range of features and specs. Models in this series feature up to 15.4 pounds of wash height, plus a Sanitize cycle that can heat linens up to 145 degrees Fahrenheit for maximum germ-killing power. The anti-vibration circular sidewalls reduce vibration up to 30%, while the 1,400 RPM spin speed extracts any excess moisture to help ease the burden of your dryer. Other features include ActiveWater Technology for more efficient water use and an internal water heater that helps water heat more quickly and efficiently. The 24-hour delay start timer is another convenient feature that allows you adapt your laundry day to your schedule. This series also features 15 wash cycles and 9 options, and features a quiet 54-73 dBA noise range that's relatively quiet for laundry. This impressive step up from the 300 series offers everything found in the list above, plus even more premium features. You'll enjoy up to 17.6 pounds of washing weight in a more efficient drum designed in the same footprint of the 300 series. You'll also love the True Sanitize cycle that heats water to a blazing 170 Fahrenheit to kill absolutely all bacteria-- great for thoroughly cleaning gym clothes. AquaShield Leak Protection uses a special double-walled feed hose and safety valve to provide protection against water damage, and the ultra-quiet 52-72 dBA noise range is an excellent feature. Best of all? It all comes packaged with gorgeous silver design accents to make your laundry experience both efficient and stylish. The flagship Bosch washer-dryer set, this series boasts all of the features offered by the two previous sets plus an impressive list of additional or enhanced features that include an interior LED light to help find that one lost sock at the back of the machine. You'll also appreciate the AquaStop Plus Leak Protection feature which includes the double-walled feed hose and safety switch from the 500 series and adds a drip pan with float switch that makes leaks nearly impossible. This is a vitally important feature in multi-story buildings where leaks can become a nightmare scenario. But that's not all-- you also get the Super Quick cycle that offers a handy 15-minute clean when you're in a rush, plus chrome design accents and operation noise as low as 50 dBA. While technically an extension of the 800 series, this impressive series offers enough unique features to belong in a class all its own. It's Home Connect feature allows you to manage your laundry from your cell phone or table. For anyone that loves the idea of a connected home, this feature lets you monitor and control your Bosch appliances from anywhere in your home or even while away. You also get an EcoPerfect Cycle which significantly reduces energy consumption, as well as an EcoSilence Motor™ that delivers quiet, efficient & long-lasting performance. That's supported by a self-cleaning detergent dispenser and an impressive 2.2 cubic feet of drum space that offers a larger capacity than other compact washers. Deciding which Bosch unit is best for you is a matter of understanding your own personal needs and preferences. If you have small children and are worried about the risks of bacteria, opting for at least the 500 series will allow you to rest easy thanks to the True Sanitize cycle it offers. If you live in a high-rise or urban area with other rooms and tenants below you, the 800 series will protect you from the disaster of a massive leak, thanks to the innovative AquaStop Plus feature. Overall, Bosch is a respected and highly sought-after brand for a reason— they produce high-quality units at a competitive price, and that’s why we at Designer Appliances proudly support their products. Do you have a 220V electric outlet? Did you purchase a stacking kit if you intend to stack the Bosch washer and dryer? Dryer needs to be secured on top of the washer. If you are wondering about other options in the compact washer and dryer category check out our comprehensive article on this topic. I heard German manufacturers are the best when it comes to compact washer and dryer sets is that true? Yes. German manufacturers such as Bosch and Miele make the best apartment size washer and dryers. Find out more about Bosch vs Miele in our recent review.